There is so much potential for playful interactions with your child based on William Steig’s book Pete’s A Pizza. Here are some variations on“reading” the book with your child. 1) Simply read this book aloud.The book begins with Pete in a bad mood. What is a bad mood? Have you ever been in a bad mood? This is a great topic to share with your child! 2) Gently “knead”and “stretch” the child’s arms and legs as you read with your child on your lap or beside you. Pretend to whirl and twirl and sprinkle on ingredients. 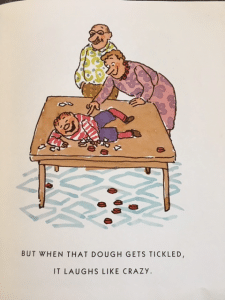 And give a gentle tickle when “Pete the Pizza” laughs. 3) Put a blanket on the floor and when Pete gets made into a pizza, do the same actions with your child including “whirling” and “twirling” your child in the air. When it’s time to cook the pizza put him/her onto the sofa. Encourage the child to run away before being sliced! And don’t forget the best part, give the child a hug at the end. 4) Use a recycled pizza box to make props for pizza making. Torn paper strips make great “cheese” and “pepperoni”. Do you have anything that could be used for powder? Water in a spray bottle could be oil. Or water in a small bowl could be sprinkled. 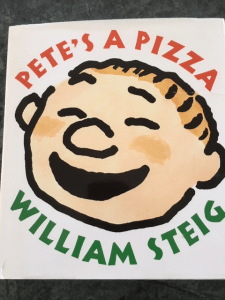 Your child can help you create this Pete’s A Pizza activity box. You and your child can take turns being the pizza maker and the pizza. 5) Make real pizza with your child. 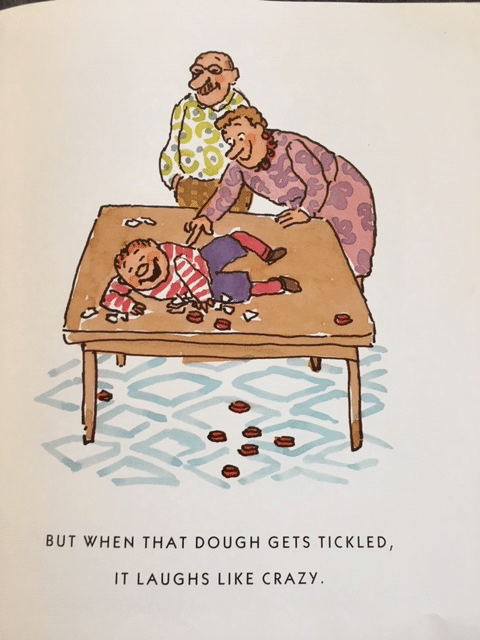 There are so many variations from easy (melted cheese on an English muffin) to more involved (making homemade dough offers children the wonderful opportunity to knead and stretch real dough). 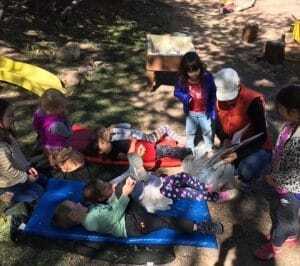 I enjoy reading this book with children outdoors. When the pizza runs away, off the children go! We have the fun of corralling them back to our reading blanket and the joy of giving the “pizza’s” a hug at the end. Give this book a try!